Initiating a design review with all key stakeholders on a project is busy work. Getting designs ready within ever-shortening deadlines is a challenge in itself, let alone the work involved in preparing for, following up on and collating the feedback from all stakeholders through a design review. 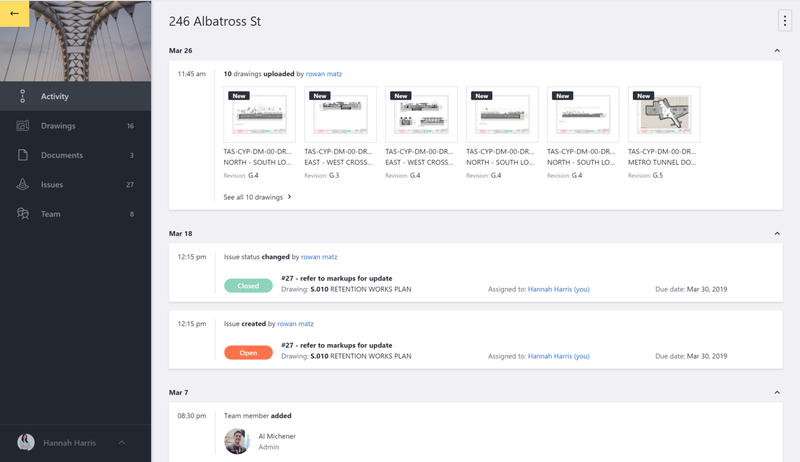 Managing your design reviews in Bullclip already helps with many of the key challenges associated with getting designs reviewed by everyone quickly, regardless of their location. However, what makes a great design review platform is whether it enables people to make better decisions on their own as to what is important to pay attention to. We think that this starts with providing context. We started with drawing-level context, and now we’re moving to project-level context. 2) making it easier to find and work on the latest designs. The Activity Feed is perfect for identifying when there is new project design information to process, kick-starting any related reviews or follow-ups automatically. No need to @mention anyone in a comment, send an email or tap a team mate on the shoulder to direct them towards your new design drawings. Yes, it is important to be aware that there are new design drawings or that an issue is waiting on your approval. However, searching for those new drawings or that issue is time wasted. As such, all key content in the Activity Feed is clickable and directs you straight to the Drawings, Documents or Issues in question. No time wasted. Further down the line, we’ll add the Activity Feed to our mobile apps and expand it to include filters to search for the event types you need. For now, we hope you enjoy this first step towards clear project progress and improved navigation. Bullclip is the only application that truly connects teams around design reviews, while still being easy enough for anyone on your project to adopt. If you are looking for a competitive advantage, be sure to trial Bullclip for your next review and let us know what you think. Learn more about Bullclip, or get started for free. More exciting updates are coming shortly. Watch this space.